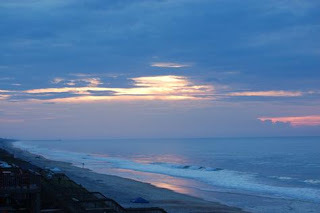 It is morning on our first vacation day of the year in NC. Tuesday we were out of the house about 10, stopped at the local coffee bar for breakfast, then hit the road shortly after 11. We took one short break after about 2-1/2 hours, then arrived at our first nights stop in Berkeley Springs, WV at about 3:00 pm. Berkeley Springs, also know as Bath, is the first Spa know to have been used by the European settlers to North America. It was surveyed by George Washington. Of course we both had a soak in a hot springs bath, Donna also had a message. This was followed by dinner at the "Corner Land and Sea", a local place that has great Crab cakes. Then we went letterboxing. Yesterday morning We had breakfast at a nearby Coffee house "The Fairfax" which has a great private blend, then Donna repeated her Spa experience, while I checked out a few more letterboxes. The terrain around the boxes called for more endurance than I have so I ran to the Post Office then picked Her up. We were on our way here (Roanoke Rapids, NC) by 11:30 and arrived at 4:30. We wanted to eat at Ralph's, a local BBQ which was highly recommended by our son Loren, but found that it was closed this week for vacation. So it was Cracker Barrel for dinner, then back to the Hilton. We have a short drive to New Bern planned for today so we might get in some sightseeing and more boxing today. So far it has been a very good trip despite the small car.